SK Telecom CEO Park Jung-ho, left, and participants attend a media showcase for the company's 5G service in Seoul, South Korea, April 3, 2019. SK Telecom will be launching commercial 5G services nationwide on Friday. South Korea on Friday launches the world's first nationwide 5G mobile networks, a transformational leap that has superpowers sparring for control of an innovation that could change the day-to-day lives of billions of people. Lee Pil-jae, second from right, vice president at KT Corp., and models introduce various 5G services available on smarpthones during a press conference on 5G service at KT Corp.'s headquarters in Seoul, South Korea, April 2, 2019. In contrast, U.S. firms have 1,368, IPlytics said, 29 fewer than Finland's Nokia alone. All three of South Korea's mobile operators — KT, SK Telecom and LG UPlus — will go live with their 5G services on Friday. 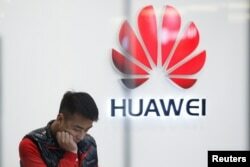 "5G's hyperspeed can connect 1 million devices within a 1-square-kilometer zone simultaneously," KT said in a report. On the same day, Samsung Electronics will release the Galaxy S10 5G, the world's first available smartphone using the technology, and rival phonemaker LG will follow with the V50s two weeks later. 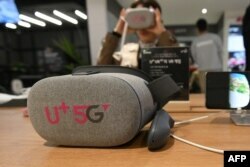 Visitors test a VR device using the 5G network at a pop-up store of South Korean telecom operator LG Uplus in Seoul, April 2, 2019. U.S. network carrier Verizon said Wednesday that it had become the first carrier in the world to deploy a 5G network — in Chicago and Minneapolis, with more cities due to follow this year. The system will work with Lenovo's Moto Z3 smartphone. "Verizon customers will be the first in the world to have the power of 5G in their hands," said Hans Vestberg, Verizon's chairman and chief executive officer. "This is the latest in our string of 5G firsts." None of South Korea's three network operators would say how much they have invested in 5G, but Seoul's Economy Minister Hong Nam-ki estimated it would be at least $2.6 billion this year alone. "If 5G is fully implemented," he said, "it will greatly improve people's lives."